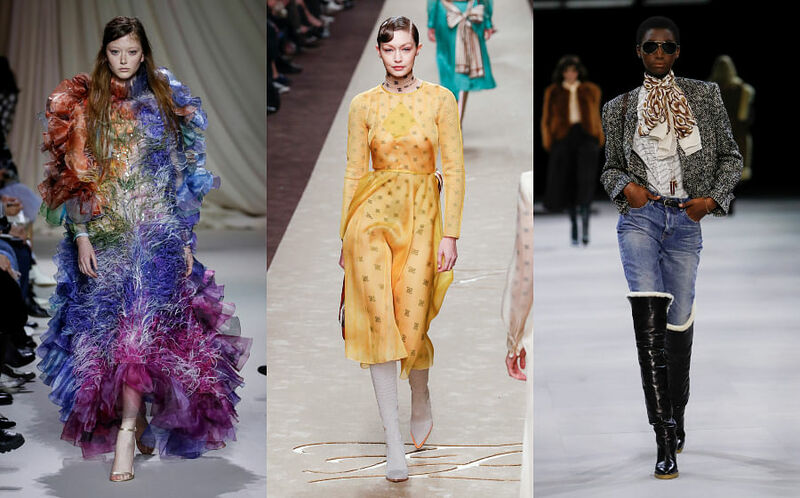 At the F/W’19 shows this year, the four major fashion capitals have served us with the new looks (Hedi Slimane’s Celine is less rock ‘n’ roll and more Parisienne), new trends (the ‘80s bolder shoulders are going to be all the rage this Fall) and new drama (the passing of Karl Lagerfeld shook the entire fashion world). Oh, and let’s not forget about the lust-worthy soles that we bet, will be seen on street style stars and Instagram really soon. 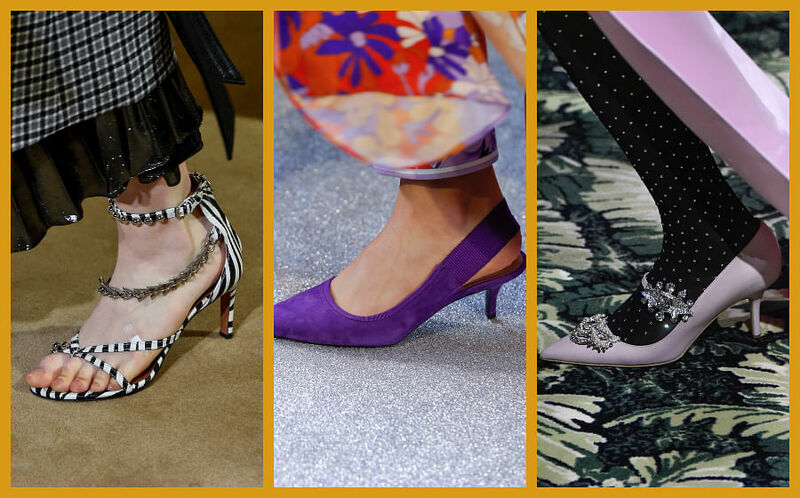 Here, we give you a list of five of the top shoe trends that were spotted on the runways of F/W’19. From sassy kitten heels to thigh-high boots, you’ll definitely want to own at least a pair in your shoe closet. 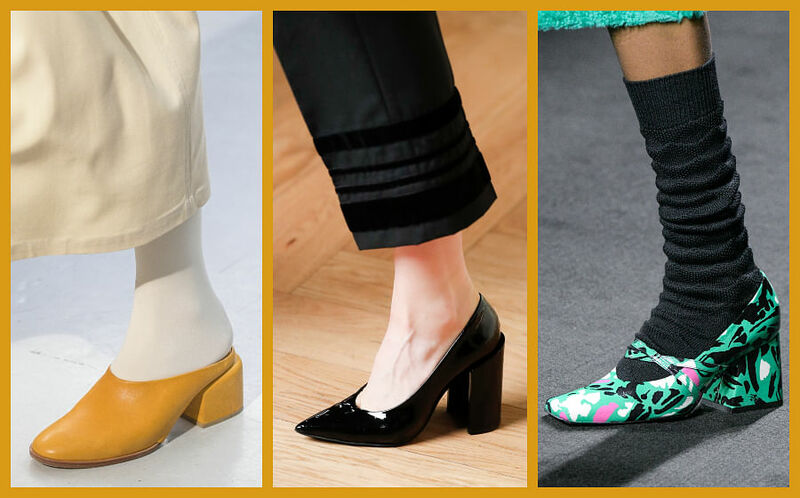 Popularised in the ‘50s, the kitten heel has gotten a lot of attention at F/W’19. For the heel of that height, this pair of comfortable soles has been given a huge splash of sass and class. Altuzarra took it to the wild and fashioned it with zebra prints and chains. Leonard Paris went with something simple and sophisticated: Purple suede slingbacks. Paco Rabanne fused the kitten heel with a Mary Jane and went full on opulent with crystal embellishments. Ugly footwear, particularly sneakers, may still be the rage in 2019. However, we believe that there will be a shift towards elegant and shimmery heels for F/W’19. Seen on Miu Miu is a pair that’s glazed in a jewel-tone yellow shade with diamante fashioned around its opening. At Unravel Project, the black pump is given a crystalised strappy rendition. Also, Paul & Joe delivered disco diva realness that’s elegant and party-ready. Even the fanciest footwear can’t outshine a good pair of practical soles. 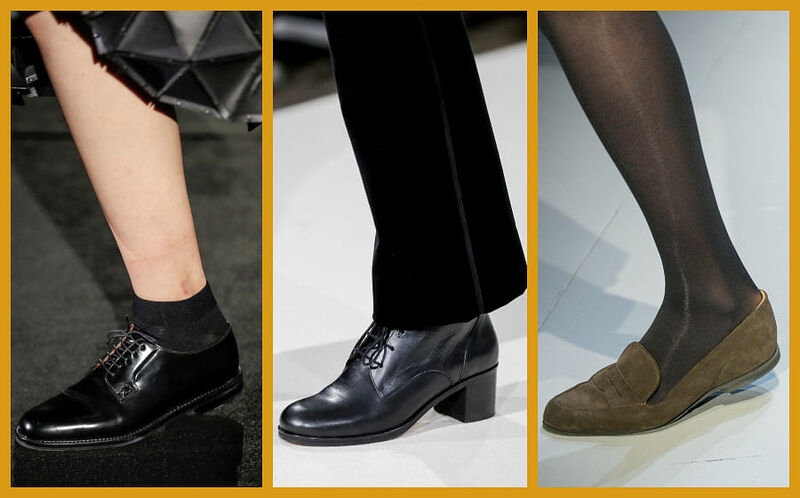 From brogues to moccasins, the Fall runways gave us a good amount of stylish and timeless flat shoes. Noir Kei Ninomiya’s black leather brogues, Agnes B’s slightly heeled oxfords and Geoffrey B. Small suede moccasins prove to show that F/W’19 knew what every lady truly needs: A good pair of comfortable shoes. If you’re looking to reach for a greater height without compromising on comfort, block heels are the best bet for you. Bonus? They’re all the rage for F/W’19. Nehera’s cheery yellow mules brought a smile to our faces. Each x Other went with a pair of black patent pointed-toe pumps for that femme fatale gravitas. And if you’re one who isn’t afraid to be adventurous with their style, Drome’s eclectic printed pair of soles have got you covered. Ah, nothing screams Fall more than a pair of sturdy boots. 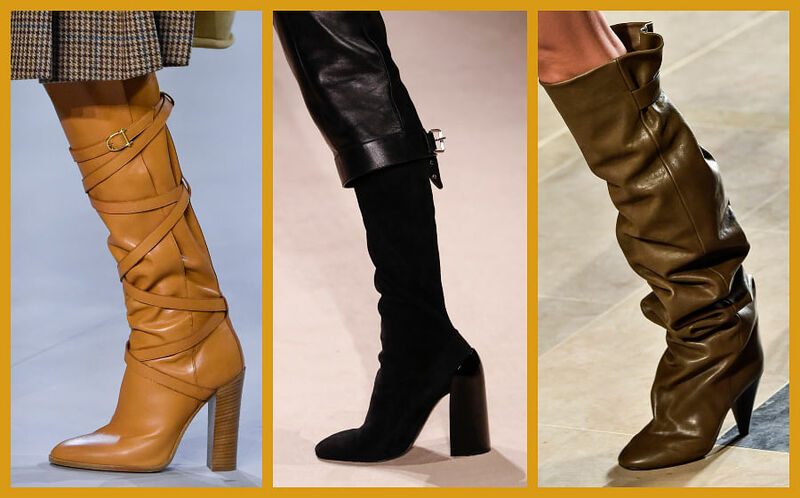 A spillover from last year, thigh-high boots are still going strong for this year’s F/W’19. 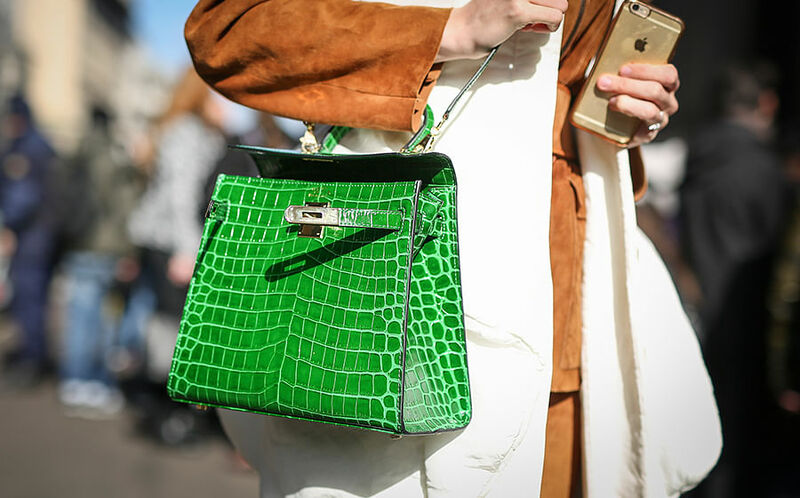 Celine mixed it up with leather strappy details. Hermès sleek pair of black boots reminds us of a classy English equestrian (no horseback riding required to don this pair). Isabel Marant’s scrunched pair simply exudes the stylish Parisienne attitude.